Where do you show the latest innovations, new materials and creative design? Where do you meet the industry´s movers & shakers and specialists? New platforms, new technology, new products and new behaviours create new challenges for the industry. 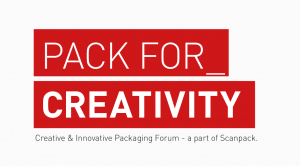 At Creative Packaging Forum you will have an excellent opportunity to exchange ideas and insights with the participants on what’s going on and what’s to come. THE SHOW presents the latest materials, the smartest designsolutions and the most innovative concepts. THE SCENE is the place for seminars, interviews, debates, work-shops, competitions, awards and start-up challenges. THE LOUNGE is where we mingle and maybe meet life-changing newbusiness contacts, or at least exchange new ideas and have fun. Welcome to our new area at Scanpack 2018!